Italy - a tale in which you want to return! Birds of the duck family left a significant mark in human mythology for many tribes, they were totemic animals, they become such gods as Zeus and Brahma, Slavic Dazhdbog rode in a boat pulled by swans. 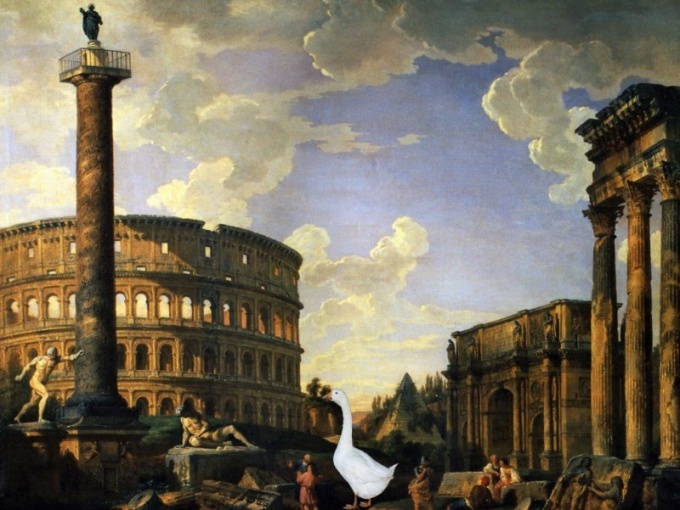 Popular legend about the history of Rome would have ended after a few centuries after its Foundation, if not the geese who saved him from enemies. At the beginning of the 4th century BC, among the Gallic peoples stood out mighty tribe of Simonov. Under the leadership of chief mortal stony came to North Italy and established on the Adriatic coast town of Hay Gallica. Zenoni tried to expand their holdings in the Apennines, besides, they preferred the nomadic life settled and happy trips and wars, so constantly attacked the nearby city. Stony controlled all large territory and finally reached the lands that were subject to the influence of Rome. The conflict between Rome and the Gallic tribe began after stony camped near the city of Clusii, which had a mutual assistance Treaty with Rome. The Roman ambassadors tried to resolve the issue peacefully, but Brenna said that the strong have a divine right to enslave the weak. Soon the Gauls attacked Klusi, in the battle near the walls of the city took part one of the Roman ambassadors, who killed a noble Gaul, it was noticed by the Mortal. He was angry, took the Roman ambassadors with all the honors, and those joined with him in the fight. Stony decided to go to war against Rome itself. On the river Allia Roman and Gallic armies met, Brenn struck the Romans defeat and continued movement in the direction of Rome, who had no one else to protect. Thus, the city was captured in 390 BC, Only a handful of defenders managed to take refuge on Capitol hill. The Gauls besieged the hill a few months but could not capture it. One of the Gallic generals noticed on one of the slopes of the hill and flattened the grass in this place were down the hill the Roman messengers, who tried to collect the militia from the surrounding land. The Gauls decided that if the steep slope, unable to climb the Romans, then they can do it. To capture the hill, it was decided to carry out a covert night RAID. Climbing the hill, the Gauls saw that the tired, the hungry, the guards are asleep, and got ready to quickly destroy all the defenders of the Capitol. But at this moment the sacred geese from the temple of Juno raised a ruckus, the Romans woke up and repelled the attack. Particularly famous in this battle mark Manley whose exploits depicted on Roman reliefs. Soon came to the city appointed dictator of Rome the mark of the Furies Camille with numerous militia, he managed to drive the Gauls out of the city. According to one version, the geese made noise not because of the fact that smelled of enemies, and due to the fact that one of the Roman guards, despite a strict ban, decided to eat the sacred goose just at the time of the attack of the Gauls.